Alfreda (right) with a Bericote Kennelmate (Barbara Of Bericote). Alfreda (owned by Miss Simmons) and Sirfreda (bred by Miss Simmons, owned by Mrs Squibb). A quick glance of the six UK authored breed books we have at hand reveals that one book provdes two paragraphs on Bericote, the other five books give, at best a sentance, or just a mention of the kennel name, or nothing at all. AHT is pleased to provide this article and highlight a kennel and breeder who's importance and contribution has long since been understated. Photo above of Miss Simmons (Bericote) judging Afghan hounds at the East Sussex Canine Socities' show held at the Indoor Bowls Pavillion, White Rock Gardens, Hastings, Kent, England on 13th August 1949. 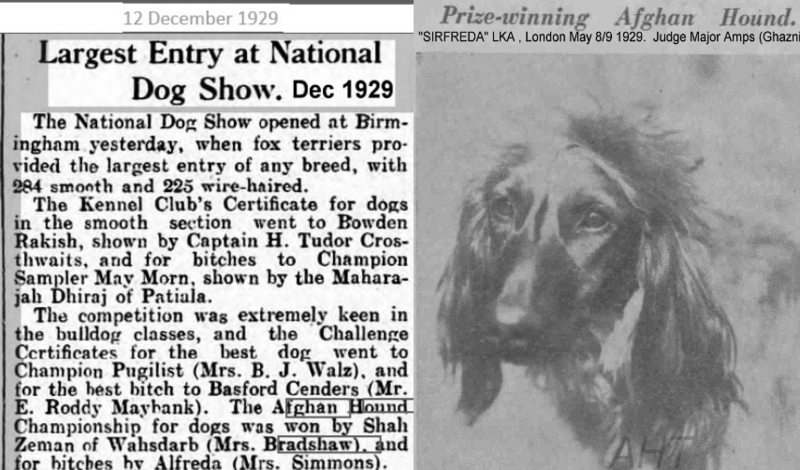 We do not have full details of entry or results but the article tells us that The "Grayling" cup for best opposite was awarded to Mrs Rileys Bletchingley Tajomeer and who is presumably one of the Afghan hounds in the photo above, possibly the left most hound, if the lady handler is in fact Peggy Riley?